"B-Tube" technology Unlike a regular oval shape "O" type radiator tube, CSF uses a specially engineered tube in a shape of a "B". These "B-tubes" are carefully formed and then brazed over the seam to seal. 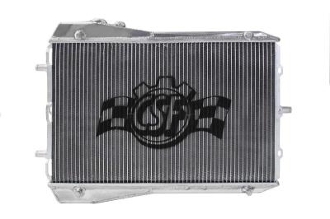 CSF is able to use thinner and lighter aluminum material (better cooling efficiency) because this design is actually stronger than normal "O" shape tubes that are welded. The design (inlet in the middle of tube that is seam brazed) increases the heat transfer surface area of the tubes by approximately 15% over regular tubes. You get the efficiency of 2 smaller tubes vs. 1 large tube within the same space criteria. With B-tubes you are able to get "dual liquid laminar flow. High Efficiency Multi Louvered Fin CSF uses ultra efficient multi louvered fins that are carefully and precisely aligned to maximize airflow through each radiator core. Fin specifications are carefully measured and calculated for each application, and tested for maximum heat rejection efficiency in our wind-tunnel lab. Features: "B-Tube" Technology Wind tunnel tested for optimal radiator core cooling efficiency ISO 9001/9002 certification CNC machined fittings All Aluminum tanks and core. Aluminum welded construction also provides much better durability for track and race use.